Use stemware storage to keep fragile wine glasses organized as well as stored in a safe spot. By hanging them in your dining room or kitchen you can create a place where they are easy to access as well as protected. Decorate your dining area with this multifunctional display curio. Fully equipped with plentiful storage space, it features a beautiful tall glass door with four shelves behind for displaying all of your favorite china, or perhaps a wine and spirits collection. A lower cabinet with a decorative wood carved front adds character as well as concealed storage space for other dinnerware, and a single drawer above with unique trimming adds space for tucking away silverware and other dining utensils. Above the drawer is an open compartment with a beautiful mirrored back, as well as an upper stemware wrack to neatly and orderly store wine glasses. Full of modern storage conveniences but also wonderfully crafted with a classic, traditional design, this display curio cabinet is a must have to polish your formal dining area. The Woodmont 2 Door Display Curio Cabinet with 1 Drawer by Standard Furniture at Carolina Direct in the Greenville, Spartanburg, Anderson, Upstate, Simpsonville, Clemson, SC area. Product availability may vary. Contact us for the most current availability on this product. Finish Beautiful medium brown finish with mild distressing gives a luxurious full bodied appearance that is both warm and bold. Quality veneers over wood products and select solids are used throughout. Grasp hold of Woodmont to create a home that is traditionally styled with a contemporary flare. Fashioned from wood veneers and solids, it features a rich, brown finish throughout that is not only warm and comforting, but also enlivening to brighten up your home. Beautiful and intricate woodwork is one of the key features of the Woodmont collection, with complex scrolled designs that lend visual interest and dimension. Including occasional pieces, Woodmont offers a tasteful take on traditional woodwork and modern finesse to craft a home collection that is intimately casual with a sleek, refined elegance. 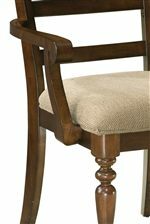 The Woodmont collection is a great option if you are looking for Transitional furniture in the Greenville, Spartanburg, Anderson, Upstate, Simpsonville, Clemson, SC area. 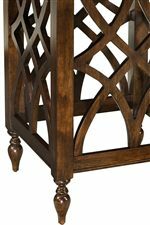 Browse other items in the Woodmont collection from Carolina Direct in the Greenville, Spartanburg, Anderson, Upstate, Simpsonville, Clemson, SC area.